This massive book clocks in at 338 pages, 1 page front cover, 1 page editorial, 2 pages of ToC, 1.5 pages of SRD, 3 pages of advertisement, 1 page back cover, leaving us with a colossal328.5 pages of content, so let’s take a look! Wait a second, though – A quick glance at the list of developers for this book will show you that I worked on this. I am writing this article since I was explicitly asked to by my readers. That being said, considering the sheer size of this book and my own involvement, I will not provide a point by point analysis of the content and also will refrain from adding a final rating to this book. Got that? Great! So, before we dive in, let’s just say that the Advanced Races-series, from which this book was collated, basically was hit and miss for me in its original iteration. If you take a look at my reviews for the series, you’ll be able to easily ascertain that. Basically, in some instances a complete rewrite was all one could do. Guess what? This book provides just that. But before we take a look at this aspect: This is not simply a collection of old material; quite the contrary: In 21 massive chapters, a lot of races are covered. 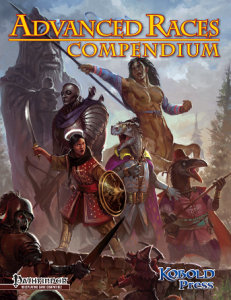 Aasimar, Tieflings, Centaurs, Darakhul, Derro, Dragonkin, Gearforged, Gnoll, Kobold, Lamia, Lizardfolk, Ravenfolk, Shadow Fey, Tiefling, Tosculi and Were-lions are back, obviously – but we also get whole chapters on Dhampirs, Drow, Jinnborn (see Southlands), Minotaurs, Sahuagin and Trollkin. So the scope of this book, in itself, exceeds the sum of its constituent parts by quite a lot. However, the book does several things right – almost radically so. One crucial issue pertaining races, ultimately, is the power-level of the races. Core races are weaker than the planetouched and then there are races even beyond that…so how to balance them? High-powered groups want high-powered races, gritty rounds prefer more down to earth solutions. Well, this pdf actually provides something so simple it honestly should become the standard: Scaling advice for the races. While not all races feature advice like this, most do -and personally, I consider this a glorious solution to the table discrepancy issue regarding racial power. Now the book’s massive array of races is impressive, sure, but how is the coverage? Well, as a basic idea, each racial chapter consists of approximately 1/4 fluff, including age, height and weight tables and notes on interaction with other races, while also offering a significant array of cultural information, which, more often than not, adds some very unique twist on the concepts. Aasimar, as depicted herein, hearken in flavor to the larger-than-life nephilim, with powerful passions defining them and their very nature feeling less like a celestial crossbreed and more like a race of powerful paragons – and before you ask: There is a bunch of new material herein for each race, with ~3/4 of an entry being devoted to racial crunch that ranges from traits to feats and archetypes, with a wide variety of unique alternate racial traits. Aasimar, btw., would be a good example for the great work of my fellow developers on this book – I had no hand whatsoever in this chapter and it came out vastly improved, eliminating the power-creep spell of the original installment, as just one example, and replacing it with evocative, unique spells. Most of the races now also sport a racial combat style feat-tree, allowing for unique styles, with e.g. Ravenkin building upon the racial trait ironclaw or dragonkin gaining swift-action control over their scales, allowing them to harden them temporarily…and enhance their own resistances, of course! An occult ritual for draconic ascension can be found here as well. Drow are aligned with the themes of sin herein and the book offers a massive array of sin domains and feats for them – oh, and, of course, Midgardiana is included in the otherwise easy to adapt fluff, so even if you do not play in Midgard, this book has ample of material waiting for you. I’m rambling. Werelions now also have a much smoother iteration – while the 1-level racial paragon-insert is certainly an option, growing into power via FCO-options and the like similarly makes the race now much smoother and, once again, allows for table variation -choose the system that works best for you and run with it. Flavor-wise, Raging Swan Press “Sunken Pyramid”‘s unique sahuagin culture penned by Marc Radle has found its way into this book as well, sporting the unique poetry of the race, the Cal’mecac. Tieflings, to provide another example that is pretty near and dear to many a reader out there, now feature the previously somewhat problematic random features as codified alternate racial traits. I should also mention explicitly that the above races–list is nowhere near complete: Backers have commissioned extra information on kitsune, ratfolk, suli and weresharks – these, however, are found in the appendix, with the respective write-ups being more crunch-centric: While age, height and weight tables and the like are all here, including FCOs, alternate racial traits and archetypes, the respective races here in no way approach the level of detail featured for the main chapters. But then again, there are some true GEMS to be found here: There would be, for example, the Spectral Shepherd spiritualist, whose phantom takes the form of a chittering swarm of ghostly rodents! And yes, the playing experience is glorious, the fluff awesome and with feats like Plague Carrier, I felt reminded of the Skaven…and that’s a damn good thing! Weresharks build upon the systems established for werelions to reach their full potential…these entries may be briefer than the big ones…but they sure are evocative and awesome. I glossed over one crucial component of this book – it may sport a couple of minor glitches (to be expected from a tome of this size), but it provides true inspiration for the respective races, adding often downright evocative pieces of information to them, sometimes blending the crunch with fluff in intriguing manners: Dhampirs acting basically as leeches to treat poisons and diseases? Now I can see that act as a great narrative device beyond its immediate use. This book is chock-full with such tidbits and even if you only use a fraction of the material, there is a LOT to scavenge. Want to play a kobold who can tumble over traps sans setting them off? One feat. Did you know about the duality of proud individualism and shared culture among minotaurs and the dread, original deity, primordial “The Hunger”, lurking and waiting to once again plunge them into barbarism? About their freebooters? The delirium bloodline offered for them as a gift by the Moon? The minotaur-only spell that transforms you into a more powerful albino for its duration? I could write 10+ pages of these and still would not have exhausted, by a long shot, what’s in this book. Editing and formatting are very good – while there are some formal hiccups here and there, that’s to be expected from this dense a crunch-book. More important would be that the crunch, even in the rare cases where it is not perfect, is functional and diverse – the aforementioned archetype for the ratfolk? Just one example for the cool ideas herein. Layout is GORGEOUS – two-column, full-color and studded with artworks of a rare beauty. In short, this is one of the most beautiful books you can find for PFRPG. The pdf comes fully bookmarked for your convenience, with nested bookmarks and all. Unfortunately, I can’t comment on the print version, since I do not own it, but if Southlands is any indication, it should be one impressive tome. Alexander Augunas, Wolfgang Baur, Thomas Benton, Matt Blackie, Savannah Broadway, Clay Clouser, David “Zeb” Cook, Dan Dillon, Mike Franke, Jim Groves, Brandon Hodge, Chris Harris, Steven T. Helt, Victoria Jaczko, Jenny Jarzabski, Amanda Hamon Kunz, Jeff Lee, john Ling Jr., Stephen Radney-McFarland, Karen McDonald, Ben McFarland, Nicholas Milasich, Carlos Ovalle, Holly Owalle, marc Radle, Wade Rockett, Stephen Rowe, Adam Roy, Jason Sonia, Owen K.C. Stephens, Brian Suskind, Morgan Boehringer, Adam Daigle, James Jacobs, Chrsitina Stiles, R. William Thompson, Mike Welham. Take a good look at this list. You’ll find legendary Paizonians and significant players in the 3pp-circuit here and the book, as a whole, does show the work of these fine folks. My fellow developers Alistair Rigg, Amanda Hamon Kunz and Ben McFarland, under the watchful eye of Steven T. Helt, have done a great job and lead editor Scott Gable with further support by Wolfgang Baur, Eytan Berstein, Annte Cranton, Chris Harris, BJ Hensley, Miranda Horner and Kim Mohan, did polish this book further. If anything, this book is testament to the importance of both good editors and developers, the unsung heroes of the RPG-industry: The refinement in direct comparison to the previously released books is staggering in scope and bespeaks the work-ethics and will to improve and streamline what’s not yet stellar exhibited by Kobold Press here. The fruits of all their labors are here to be enjoyed – ripe and shiny. In short, this is perhaps the most evocative big race book you can currently buy in the 3pp-market. The book sports a vast plethora of unique and cool takes on classic “uncommon” races, with ample truly novel, never before properly covered races. More importantly, this book’s array of races allows you, should you choose to, say goodbye to the traditional Tolkien races – the diversity herein provides the means to generate fantasy that may be beholden to the classic tropes, but without being enslaved by them. The achievement of this book does not only lie in its crunch, though it certainly has improved significantly: To me, it lies in the mythological resonance it invokes, in the unique feeling the races have – if you utilize the options herein, no one will mistake your darakhul for just another undead race, your gearforged for a paltry standard construct, your dragonkin for another draconic-men-race. The rules enhance the respective cultural identities crafted for the races within these pages, rendering the totality of content greater than the sum of its parts. Want to play a campaign of minotaur corsairs battling draconic empires, while lamia and tosculi lurk on the mainlands? An Espionage war between ravenfolk, drow and shadow fey? This book has you covered. The racial identities provide what they should: Inspiration. Suffice to say, this ranks as one of the best racial books I have had the pleasure of reading. It may not be pure perfection, but it is the most inspiring racial book I have read in quite a while, a factor that is ultimately the most important component for me. Thank you for reading this. If you do have this book, drop me a line and tell me what you enjoyed most about it, will you?